So far she has been the least visible minister in the Swedish government. That’s about to change as she is setting up a think tank in the government offices. Kristina Persson, Sweden’s Minister for Strategic Development and Nordic Cooperation, enters the conference hall in Tromsø just as an American oil executive describes the advantages of shale oil. “This is a great story, a once in a lifetime opportunity,” he says, as enthusiastically as a Pentecostal preacher in an American small-town church. Everything is looking up. American oil production is about to break new records. Production is growing by 100,000 barrels a month. “Texas has tripled its oil production in five years. The state is now a larger oil producer than all of the 12 Opec countries, except for Saudi Arabia,” says Greg Leveille, General Manager at ConocoPhillips’ Unconventional Reservoirs Technology Program. What he is not saying is that American shale oil could eliminate Norway’s future plans in the Arctic. Shale oil is the reason oil prices have halved. Today’s oil price of 50 US Dollar a barrel means it is no longer profitable to explore the oil fields discovered in the Norwegian parts of the Barents Sea. “But for people living in the Arctic region and for Nordic cooperation the fall in oil prices could be an advantage,” says Kristina Persson, as we some time later sit down — in a Nordic fashion — at a table in the university’s student canteen. “Everybody knows the Norwegian oil era will end one day. But it has been hard to do anything about this as long as things have gone so well. “Now people are forced to think new and to develop new exportable products and services. This can become an advantage for the Norwegians, a bit like when Sweden became a bit more humble after the economic crisis. “We were no longer the cocky big brother, but more like the helpful big sister,” she says. Kristina Persson is in Tromsø for the Arctic Frontiers conference. She is being presented with a report alongside the Norwegian Prime Minister Erna Solberg and the Finnish Prime Minister Alexander Stubb. It was commissioned by the prime ministers of the three countries in April 2014 (see separate story). One of the report’s key conclusions is that the Nordics should speak with one voice on Arctic issues. That is easier said than done, however. Sweden wants a fossil fuel free society by 2050. Meanwhile, on the same day as Kristina Persson attends the Tromsø conference, Norway’s government opens up large areas in the Barents sea for oil and gas exploration. For the first time since 1994 oil companies have been given permission to drill in completely new areas on the border with Russia, near the Arctic ice edge. “We do this because we still consider oil and gas to be part of our future energy production. 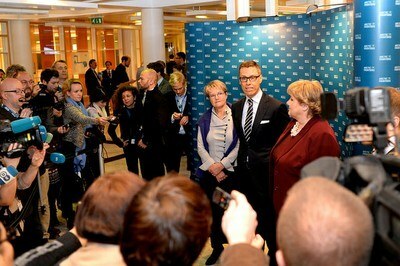 We feel this region deserves the jobs and economic development which have benefited other regions in Norway earlier. We don’t think it is fair to say the Arctic is an area where you are not allowed to do this,” Erna Solberg tells a press conference featuring the three ministers. She would rather use today’s falling oil prices as an opportunity to introduce a CO2 tax which was high enough to make renewable energy sources competitive with oil. Kristina Persson is one of the less visible ministers in Stefan Löfven’s centre-left government. When Sweden’s national wire service, TT, counted the number of articles written about the different government ministers in 2014, Kristina Persson came last. But few people enjoy such broad experience of how politics works on different levels — regionally, nationally and internationally. Her CV is as long as a smorgasbord. She started out in the Ministry of Finance in 1971, then moved to the Secretariat for Future Studies during the first oil crisis. She spent the 80s in the trade union movement — first at the Swedish Trade Union Confederation (LO), then at the LO-TCO Secretariat of International Trade Union Development Co-operation (run by LO and the Swedish Confederation of Professional Employees (TCO)), later at the Confederation of Nordic Trade Unions (NFS) secretariat, and finally at the TCO. During the 90s she was an MP and then an MEP, before becoming a county governor and deputy governor of the Swedish central bank. From 2007 she led the think tank Global Challenge, which she had founded herself. “My work involves pursuing the long-term development of ideas at the Government Offices. This will include the green transition, jobs and distribution, and initiatives to influence the global agenda for sustainable development. I will also work to ensure that the Nordic countries cooperate and make use of their combined strength. Together we are an actor with clout." It sounds like you are building a think tank within the government? “Yes, you could put it that way,” she admits. What is your role as Minister for Strategic Development? Do you report directly to the Prime Minister? “I sit in the Prime Minister’s Office and have close contact with Stefan Löfven. My work is to prepare policy development and reforms. “And then, of course, it is Stefan Löfven’s and my responsibility take this to the government offices. First you discuss the issue in the analysis groups to develop various proposals, which are then discussed by the government before being taken to the level where political decisions can be made. Her role as Minister for Strategic Development with her own think tank indicates that Stefan Löfven’s ambition is to govern for a long time. He wants someone who can see things in a long perspective. But so far her ministerial role has created little attention. Among just a few press releases there is one about an initiative for Nordic cooperation to harmonise regulations in the construction industry. “National construction rules should not make energy efficient construction more expensive of difficult. If the Nordic countries want to become leaders in green technology, we need more common frameworks, rules and procurement. That will make it easier for businesses to operate across the Nordic region,” she says. She has long been engaged in the fight against border obstacles. The Nordic region in the G-20? In another press release you can read about her reaction to Norway’s Labour Party leader Jonas Gahr Støre’s suggestion that the Nordic region should apply for membership in the Group of Twenty (G-20). Together, the Nordic countries would represent the world’s tenth largest economy. “It’s an interesting proposal. But first we should develop a common agenda and drive issues in international settings focused on for instance sustainability and green growth,” she says. “I have sympathy for Støre’s ambition, but it is quite futile to believe that we would be allowed in no questions asked, without first making sure we qualify for a position like that. The only way to do that is to make a proper contribution. According to the report “Growth from the North”, the Nordic countries should consider the Arctic Council to be the most important venue for dealing with Arctic issues. That would mean a lesser role for the Barents Euro-Arctic Council, which has been central to Norway’s cooperation with Russia. “This diversity is good in many ways, but the sheer number of cooperation organizations, working groups, funds used to finance projects in the Arctic, and other international actors and agencies relevant to the region can lead to poor policy coordination,” the report says. Do we need all these organisations, or should we close the Barents Euro-Arctic Council? She also supports the suggestion that the three countries’ communication ministers should meet once a year to discuss Arctic transport issues. “I am a Jämte [a person from Jämtland], and that makes you half Norwegian, really. My family has always had strong links to Norway, and we have travelled there often. My first ocean swim was in the Trondheim fjord, which is also where I learned how to fish for eels and to dive, so Norway has always been close to my heart. Meråkerbanan is the Norwegian stretch of the international railway between Trondheim in Norway and Sundsvall in Sweden. The Norwegian government has decided it will be electrified, but work only starts in 2017 and will finish no sooner than 2022. I’m reading Lena Andersson’s “Limited Liability". It’s a continuation of her last book “Arbitrary Conduct". It’s a relaxing read about relationships, male and female, and about love. I have always been using email a lot, and sometimes I use Instagram, socially. When I was very young I wanted to be an actress. I did a lot of children’s theatre. It would be nice to have many hidden talents, but the ones I do have I like to show. I’m good at telling stories. Stories for children.